A Quick Breakfast – Annoyingly Boring? With it occurring on a Saturday it could have involved me whipping something up in the kitchen at home, but with some morning errands to run (oil change, haircut, dropping the boys off at a neighbor’s to do some raking) it was on the go. 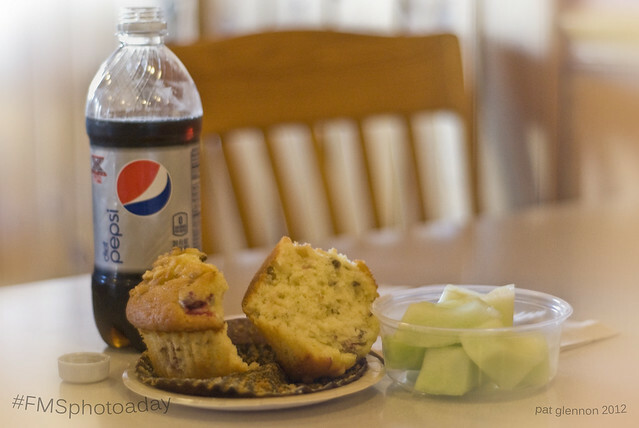 Cranberry Nut Muffin, Honeydew Melon & a Diet Pepsi. All things being equal I would have had a Diet Coke, or Coke Zero, but it wasn’t an option at Dawn to Dusk in South Weymouth. Ooh, I’d opt for the Diet Coke too. But, in a pinch Diet Pepsi works. Looks like a yummy breakfast.